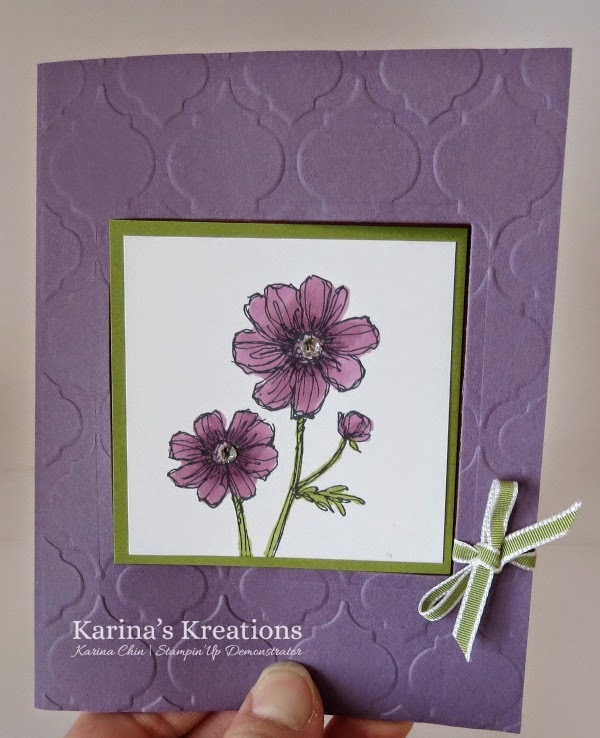 Karina's Kreations: Blooming With Hope Fancy Fold Card! Blooming With Hope Fancy Fold Card! I demoed Blendabilites markers at the Creative Day Getaway and this was one of my demos using the new Bloom with Hope stamp set. The only way to get the bloom with hope stamp set is to host a private class or get the starter kit for $60.00. You could choose this stamp set as one of your items. The kit is only on sale until June 30th! 1. 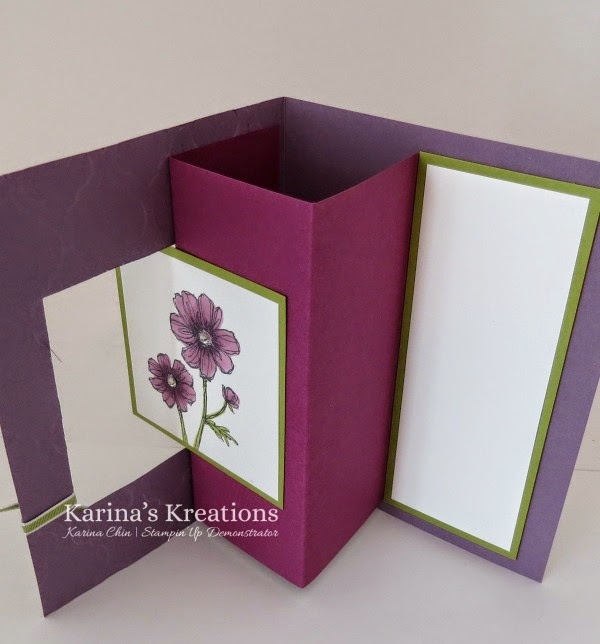 Cut a 5-1/2” x 8-1/2” card base from Perfect Plum card stock. Score at 4-1/4” to create a card base. 2. Emboss the front of the card with the Modern Mosaic Embossing Folder. 3. Using the 4th largest framelit, cut a square from the front of the card. 4. Score 5” x 7-3/4” Rich Razzleberry card stock at 2”, 4” , 6”. 5. Place the 4th largest square framelit on the 1-3/4” x 5” panel. Place the sharp edge of the framelit along the score line centering it. Run through the Big Shot machine. 6. Place sticky strip on the two tabs that were created Fold them back and center it on the inside of the card lining up with the square window. Fold the other score lines the same as the picture. Add sticky strip to the last panel. Close the card, attaching the back panel to the card. 7. Add 2” x 5” Old Olive card stock to the back panel. Attach 1-3/4” x 4-3/4” Whisper White card stock to the Old Olive card stock. 8. Stamp the flower image with Memento ink on 2-5/8” x 2-5/8” Whisper White card stock. Color the image with Rich Razzleberry & Old Olive Blendibilities markers. 9. Attach Whisper White card stock to 2-7/8” x 2-7/8”Old Olive card stock. Close the card and attach the Old Olive square. Only place adhesive and half of the Old Olive Square so it can swing through the opening.